All seed supplied by Cosmic Clivias is produced by careful hand pollination each flowering season in our enclosed Greenhouses. Seed is harvested in late May/June each year at which time it is cleaned and treated with a fungicide/bactericide and dried ready for packaging and shipment around the world in late June/July. Our Presales seedlist is available from March 1st each year and seed is sold on a first come first served basis. If you wish to be on our mail out list please contact us at - cosmicclivias@gmail.com We accept Paypal. * Although we take great care when pollinating using high quality genetic material we cannot guarantee the outcome due to genetic variation. Please click on Thumbnails for larger Pictures. *NB There is a minimum order of 3 seeds per item. Large flowered, reflexed, broad tepaled warm pinky peach blooms of quality. Big umbels of beautiful peachy pinks with a slight reflex and excellent form. Beautiful baby pinks with a slight reflex and excellent form. Smooth bubblegum pinks of good form on vigorous plants. Unique colour strain in melon peach tones with lime green centres! Two fantastic clones, Full round umbelled peaches of great colour and form for the show bench. Big 'Vico Peach' types in softer peach tones, some with improved 'Halos' in the center. 'Just Peachy' has huge heads to 300 mm across! 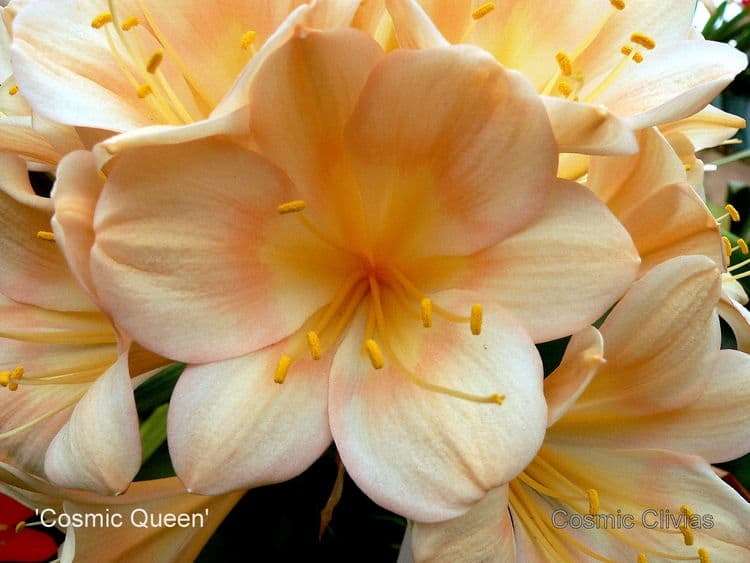 Classic high quality rich pinky peach blooms slightly reflexed with full large umbells. 'Peach Bounty's rich colour and very full umbells (up to 50 blooms! )coupled with a deep GT peach for improved green throat peaches. Rich browny bronze with green & white throats on vigorous plants. Line bred green throat pastels with broad reflexed tepals on full umbells. 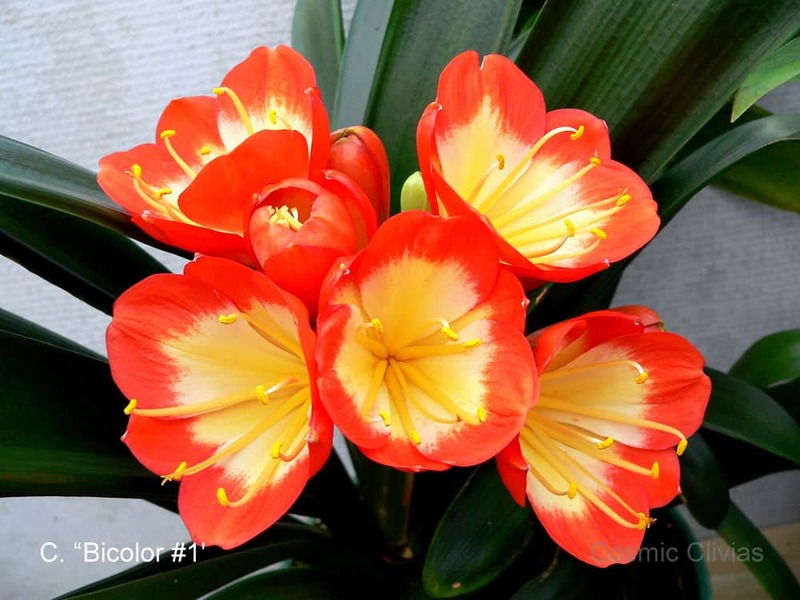 Big (90 mm) blooms of bright redish orange blooms with broad tepals, soft green throats and vigorous plants. Good number of polytepals with some variegation expected from this Vico/Solomone line. Simply huge flowers (Both 100-120 mm) with very broad tepals from our two biggest yellows, the very best! Selfing of this famous F2 'Sir John Thuron' clone. Two great Hirao green types, Broad tepals & full umbels with good colour and form. 'Magna Verde' has 45 mm wide petals & is 90 mm across the flower! Two great Hirao green types, broad tepals and full umbels with good colour and form. 'Magna Verde' has 45 mm wide petals & is 90 mm across the flower! Richly coloured Group 2 greenthroat yellows on large umbells of good form. A few greens also. Line bred greenthroat reds with full umbells. Outstanding Picotees with bright orange/red tips and slightly reflexed blooms on full umbells. Richly coloured Picotees/Bi-colours with broad tepals and slightly reflexing large blooms of quality. Richly coloured Picotees/Bi-colours with broad tepals and slightly reflexing blooms of quality. Exciting new Green throat versicolours of great form and colour. #27 X (F2 Rumplestiltskin x 777) x 'Lime Paprika"
Exciting new green Throat Versicolours of excellent form and colour. Excellent Akebono variegation crossed with our very best orange with 110 mm blooms on 250 mm heads! Chinese yellow blush with Light of Buddah foliage, very special. #30 X 'Cosmic Splash' x Sibling Both parents are excellent polytepals with 10-12 tepals and big reflexed flowers. #31 X Four Marys #1 x Four Marys #2 Line bred strain from the famous Mc Neil collection. #32 X Four Marys #2 x Four Marys #1 Line bred strain from the famous Mc Neil collection. Line bred strain with smaller blooms of unique colour from Alick McLeman. #35 X C. mirabilis x C. mirabilis Slow growing species requiring excellent drainage.